Blog – Tagged "History Lessons"
Not in line with the philosophy of Napoleon Bonaparte, I certainly think that freedom is for everybody. Martin Luther King Jr. believed it too and had to confront a country that had taken freedom away from its own citizens. We all know how he worked through nonviolence to combat racist and segregating laws. Learn a few more facts about Martin Luther King Jr. in celebration of his birthday! Yeah, not a lot of people know that Martin Luther King Jr. wasn’t named after his father’s original name. King Senior was born Michael King and changed his name after the death of his father-in-law (a pastor) to a historical religious leader from Germany named Martin Luther and followed in the ministry for his career. He then passed his new name to his firstborn son: Martin Luther King Jr.
Born after his older sister and followed by his younger brother, Martin Luther King Jr. was the middle child in his family. Unlike either of his siblings, however, Martin’s birthday is the only one to be celebrated as a national holiday—in fact, he’s the only other American whose birthday is a national holiday aside from our founding father, George Washington. A renowned speaker and an incredible influence to raise awareness to the injustice of the world we were living in just a little over 55 years ago, Martin Luther King Jr. helped us so we can all appreciate our birthright of equality. Enjoy your birthright today and, as always, thanks for reading! Make the Most with French Toast! You don’t have to be French in order to love this genius invention of sweet breakfast options. This eggy bread is celebrated across the country today as it’s National French Toast Day! Whip up some batter and heat up the fry pan! I’m sure you all know how delicious and exciting French Toast is, but here are some things you may not have known about this soppy, sweet creation. Has this Bread Gone Bad? Yes. In France, this bread is known as ‘pain perdu’ which translates to ‘lost bread’. Traditionally made from stale bread, French Toast was originally made as a means of making stale bread palatable so it didn’t go to waste. Soaking it in a milky, eggy batter, frying it up, and serving it drenched in syrup with assorted berries and nuts has always done the trick! Yes, like so many things, the title does not necessarily indicate the origin. French toast was actually around for even longer than France was a country. We’re not sure exactly where French Toast was first made, but we do know that before the recipe we know as French Toast was called Spanish Toast as well as German Toast before it got its French name. It’s true that no one knows exactly who invented French Toast or just quite where it came from, but mention of this recipe has been traced back all the way to the 4th Century, more than 1700 years ago in ancient Roman records! Pour syrup over it. Douse it in powdered sugar. Melt butter on top. Sprinkle berries and walnut pieces over it. However you best like to eat your French Toast, do it up right on a day that’s made just for the celebration of this awesome bread-saving dish! Happy French Toast Day to everyone and, as always, thanks for reading! A Day for Giving Thanks....and FEASTING! Hey, all you Gratified Feasters! Thanksgiving is here again—a fantastic day we all enjoy in the modern day. Filled with televised parades, traditional football games, and a dinner that’s so good, people fast all day to make sure they have enough room when they finally sit down to eat! But these traditions have been nearly 400 years in the making! Things were quite different back then. Check out some of the things that came before the first Thanksgiving feast. Pilgrims first traveled east when they were leaving their home for religious freedom. Many traveled to Sweden in the first decade of the 17th Century. By the 1620’s, however, they were looking elsewhere to settle and decided on traversing the huge Atlantic Ocean. It’s no wonder that the Pilgrims feasted when they finally succeeded in yielding crops from the land as the Natives had taught them! After all, it had been a long trip to the New World with not much variety in their diet. They mostly ate a hard biscuit called hardtack, salt pork, dried meats (such as cow tongue), pickled food, and oatmeal. That’s about it. Contrary to common belief, the Natives never did introduce the Pilgrims to popcorn. The Natives were responsible for showing the newcomers how to yield crops of corn, but not the popcorn variety. Not to mention, it wasn’t even known as corn when the Pilgrims first arrived. The word ‘corn’ refers to a particular region’s highest yielding crop. In England, ‘corn’ refers to barley. It took a while before we dubbed this cobbed vegetable corn. Enjoy the foods you’ve come to know and love when you sit down to the spread at your Thanksgiving table and ring in the holiday season like they have for hundreds of years! Happy Thanksgiving to all of our camp families out there and, as always, I am thankful for my readers! All joking aside, today is National Tell a Joke Day. It’s a day for laughter, levity, and wit. Unfortunately, I already took my serious pills this morning, so this post isn’t likely to make you laugh much. Instead, we’ll be taking a good, hard, and serious look at the origins of The Joke. The Knock-Knock Joke is thought to have its origins around the year 1900 in which a journalist of the ‘Oakland Tribune’ wrote of a jokester in the streets who was approaching random strangers and asking if they knew Arthur. And when they expectantly replied, “Arthur who?” he would call out “Arthur-mometer!” and then run away laughing. The humorous spirit of this street jokester caught on and over the years his antics developed the Knock-Knock format that we all know today. By 1935, everybody had heard of Knock-Knock Jokes. Strangers engaged one another in the street with a “Knock-Knock.” Knock-Knock Contests were held by businesses. You couldn’t even turn on the radio without hearing a Knock-Knock gag. This was the first popular example of a non-joke in which the punchline isn’t clever or funny in any way—the humor lies in subverting the expected, knee-slapping reason that the listener is waiting for. The joke is that there is no joke. 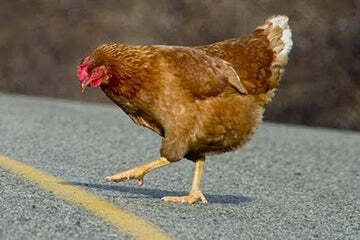 Love it or hate it, it’s led to a million alternative and ridiculous answers as to why exactly a chicken might cross a road. But jokes go back even further than that. In fact, jokes are so old that there likely aren’t any new ones really—just twists on age-old observations. Did you know that toilet humor has been traced back to our ancient ancestors because—let’s face it—farting is funny no matter what generation you’re from. Okay, well, nobody said the ancients were hilarious. Our humor has evolved as time goes on and things that we found funny years ago may not be so entertaining in this day and age. But the essence of what makes us laugh will always remain. Have some good laughs today and share some of your favorite jokes with your friends and family. Happy Joke Day, All! And, as always, thanks for reading! 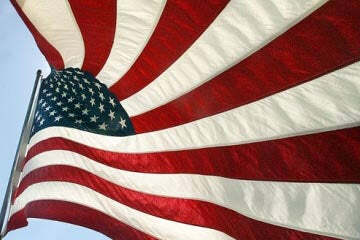 Today is National Flag Day—a day to put out your flag and appreciate the banner that symbolizes your country. Flags are national symbols. Every country has a flag. Yet, the first flags were flown before the world’s countries ever existed! Let’s take a look into the history of flags to better understand how we got our own U.S. Flag. Initially used for easy identification in warfare, the people of the High and Late Middle Ages would paint their shields with patterns to show whether they were a friend or foe. It became common, then, for knights, infantry commanders, and other leaders to fly a heraldic flag on their saddle in order to grab even more eyes with even more ease. It didn’t take long before the practice became commonplace for troops to carry their own flag out to the battlefield simply to distinguish their unit.In the early 17th century, when sailing reached an all-time peak in popularity, it became the law that ships had to carry flags in order to designate their nationality.And these are the flags evolved and transformed into the national flags and maritime flags of today. And once flags had shown their purpose at sea, they made themselves useful as a means of simple communication from across the water as well by means of interactive systems. The earliest national flag belongs to Denmark. It is referred to as the Dannebrog and, adopted in 1219, it is the oldest national flag of any country. However, by the end of the 1700s, it was one among an incredible number. And that number didn’t stop growing until every sovereign state had a national flag. The American Flag features 13 red and white stripes and 50 stars to symbolize the 50 states and 13 original colonies, the American Flag is an incredibly iconic image, but it hasn’t always looked the same. Our original Flag (modernly known as the Betsy-Ross Flag or Colonial Flag) has been changed more than 25 times as stars continued to be added as territories were annexed into states. We finally designed our modern flag in 1960 after Hawaii, our 50th state, was granted its statehood. Show your appreciation for our flag today and, as always, thanks for reading, Summer Camp Fans!